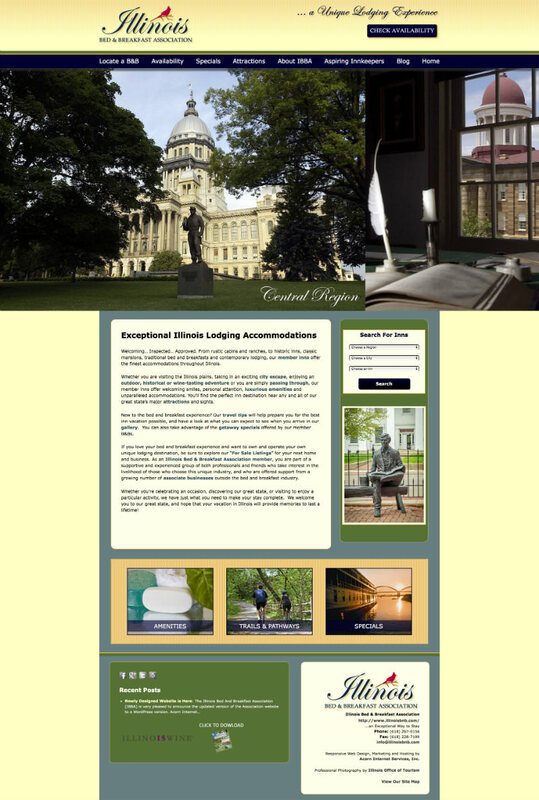 The Illinois Bed And Breakfast Association (IBBA) is very pleased to announce the updated version of the Association website to a WordPress version. Acorn Internet Services, Inc. has done an outstanding job converting the website which will be easier to navigate and user friendly. The IBBA has seven wonderful regions to explore, Chicago, Chicagoland, Northern, Western, Central, Southwestern and Southern, offering a wide variety of lodging experiences, from 1800’s homes, log cabins, modern homes, homes with lakes and air strips. Located in the country, large cities, and small towns, the Illinois Bed and Breakfast Association has a unique lodging experience for everyone. Many Bed and Breakfasts are located on one of the state’s many wine trails, hiking and biking trails, and close to historic sites and state parks. There are many festivals held in areas near our Bed and Breakfast members. Start exploring the great State of Illinois with an overnight stay with a member of the Illinois Bed and Breakfast Association.